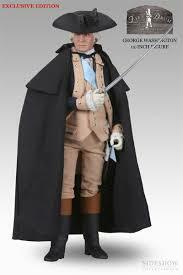 12" Action Figure Poseable from the FIFE & Drum Collection from Sideshow Collectibles. Depicts General George Washington with Copy of Orders Issued to the Continental Army at New York, 2nd July 1776. 12" action figure. 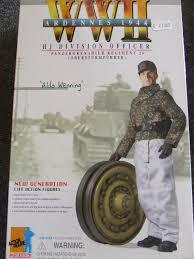 Aldo Wenning is an officer from Panzergrenadier Rg.25 ,part of the HJ Division serving in the Ardennes offensive in December 1944. 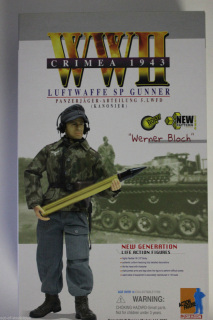 Figures comes with a wheel from a Tiger I tank. Dragon 2007. 12" action figure. Plastic/Fabric. 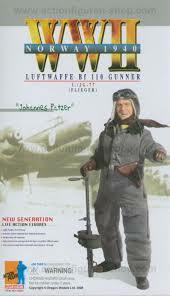 Johannes Patzer is a Luftwaffe air gunner in a ME bf110 twin engined fighter of I/Jg-77 serving in Norway during 1940. 12" action figure. Plastic/Fabric. 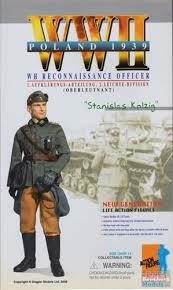 Stanislas Kolzig is a Reconnaissance Officer in 1.Aufklarungs Abteilung with the 2.Leichte Division in Poland during 1939. (Slight Scuffing to box end ). 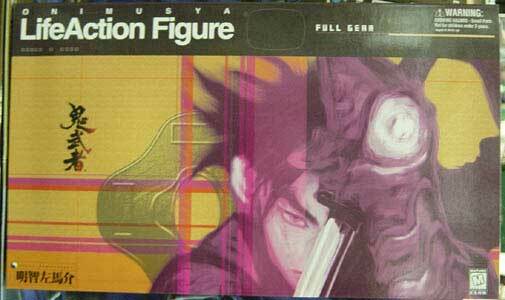 This figure has been out of its box but is in good condition and undamaged. Box is in good condition. 12" action figure.  Plastic/Fabric. 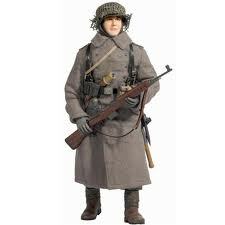 Poseable figure of Nikolai a senior sergeant in the Soviet 38th army in Kiev during 1943. Dragon 2003. This figure has been out of its box but is undamaged and in good condition as is the box. 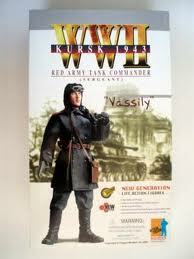 12" action figure - Vassily - Red Army Tank Commander - Kursk 1943. This figure has been out of its box but is complete and undamaged. Box in good condition. 12" Action Figure. Luftwaffe SP Gunner,Panzerjager-Abteilung.5.LWFD Crimea 1943 (Kanonier). In Splinter Smock.Comes with Brass 7.5cm round. 12" Action Figure. 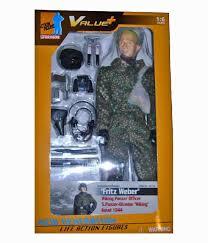 Fritz Weber is an Officer from 5. Panzer-Division "Wiking", Kovel 1944. 12" Action Figure. "Alfons Robmuller". 1. Gebirgs-Division. Russia 1941. 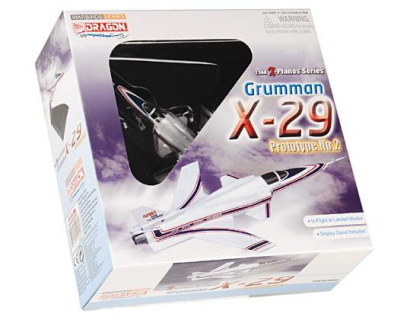 Slight Mark to Outside Box - Reduced from £39.95. (Contents Sealed). 12" action figure. 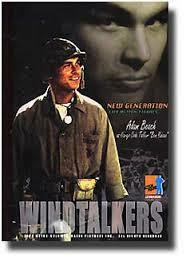 Christian Slater as Ox Henderson from the movie 'Windtalkers'. Slight Scuffing to Box End but Contents Mint. 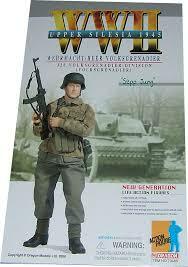 12" Action Figure - Adam Beach from the movie "Windtalkers". Slight Scuffing to Box End but Contents Mint. 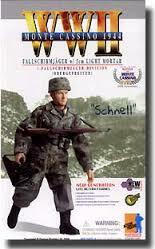 12" action figure - August Schnell - Fallschirmjager Div. with 5cm Leichter Granatwerfer 36 - Monte Cassino 1944. Dragon 2004. 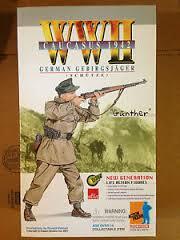 This figure has been out of the box but is undamaged and in good condition as is the box. 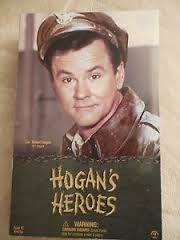 12" Action Poseable Figure of Col. Robert Hogan from the Famous Stalag 13, WWII POW Camp Comedy TV Series. Screened in the U.S.A. 1965 to 1971. Released 2002 by Sideshow. 12" action figure. 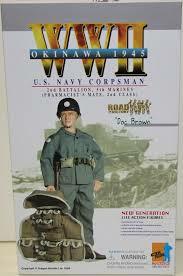 Pharmacist's Mat, 2nd class Doc Brown is a USN Corpsman with 2nd Battalion,5th Marines on Okinawa in 1945. 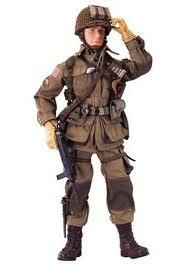 Corporal Bud Norris - 101st Airborne. 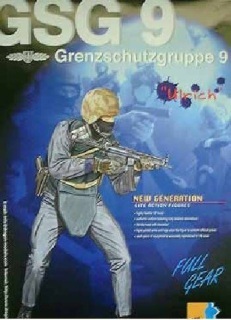 12' Action Figure (Elite Force WWII - Blue Box) 2001 - Box Slight wear but Contents Mint. 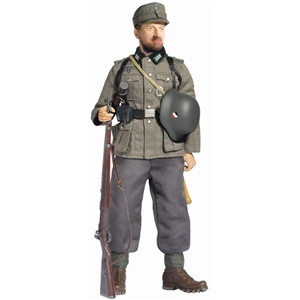 12" action figure - Vladimir - Red Army Scout - Austria 1945. This figure has been out of its box but is complete and undamaged. Box is in good condition. 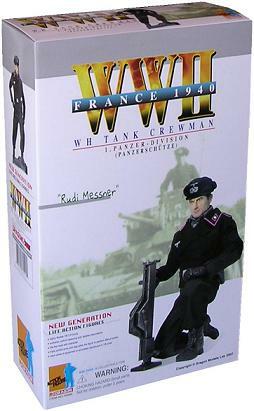 12' Action Figure - France 1940. (2nd Hand but contents Complete! Rare Dragon Figure from 2007. 12" Action Figure (Elite Force WWII - Blue Box 2001 - Slight wear to box but Contents Mint. 12" action figure. Plastic/Fabric. 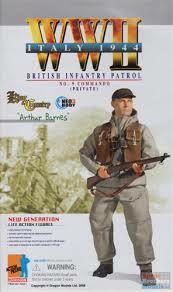 Private Arthur Barnes is with a British Infantry Patrol from No.9 Commando serving in Italy during 1944. 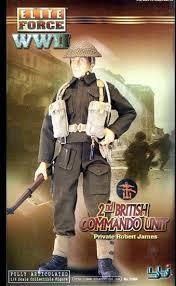 This figure comes with many new items including the windproof smock and trousers and British skeleton assault jerkin. 12" action figure. Plastic/Fabric. 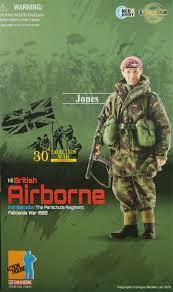 Lieutenant Colonel 'H' Jones was the OC 2nd Battalion The Parachute Regiment when it was sent to the Falkland Islands in 1982. At the battle of Goose Green he was killed leading an attack and is now buried at the Blue Beach War Cemetery. 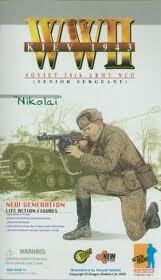 He was posthumously awarded the Victoria Cross for his actions that day. 12" action figure. 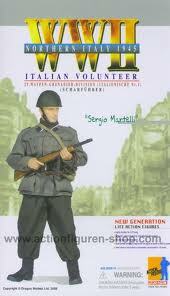 Scharfurher Sergio Martelli is an Italian volunteer in the 29th Waffen Grenadier Division (Italienische Nr.1) deployed in Northern Italy during 1945. 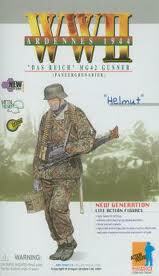 He has a new pattern Grey-Green Paratroopers uniform and is armed with a Maschinenpistole 739. 12" action figure. Ulrich is a member of Federal Germany's elite GRENZSCHUTZGRUPPE 9 Anti Terrorist Unit. Slight water damage to box which are still intact with contents in perfect condition. 12" Action Poseable Figure from Dragon 2002. Buy Both The Dragon Onimusya Male & Female for the Special Price of £80.00!! 1/144th scale. 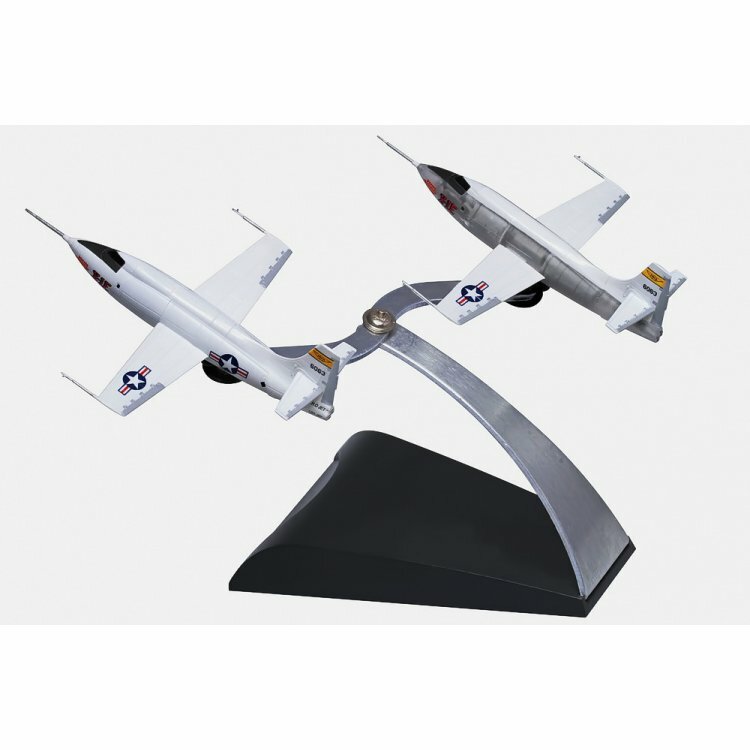 set of 2 planes (One with Clear Fuselage interior) and comes with Display stand. 1/144th scale. 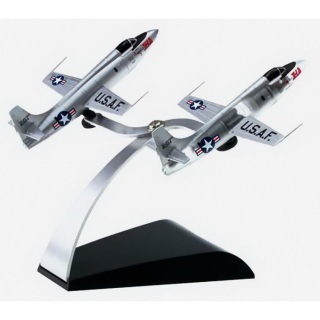 Set of 2 (One with Clear Interior details) complete with display stand. Bell X-1 E Last Flight. 1:144th scale. Die-cast metal. 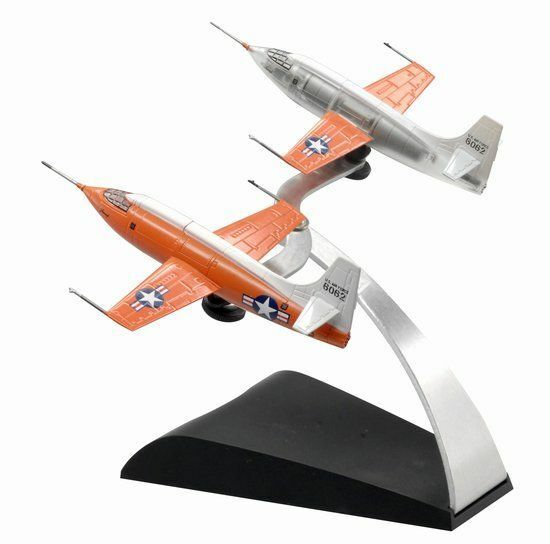 Set includes two pre-built replicas of Bell X-1 46-062 as it appeared on the last Bell X-1 flight in 1951. Second craft has see through panels allowing internal structure to be seen. Comes with a stand to mount both models. 1/144th scale. set of 2. 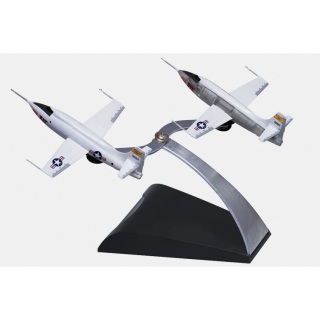 One with clear interior Fuselage details and comes complete with display stand. 1/144th scale. Set of 2 (One comes with Partial clear fuselage) plus display stand. 1/144th scale. In-Flight or Landed Modes. 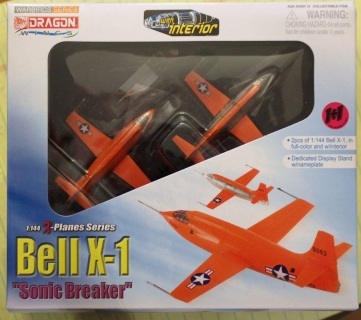 1:144th scale. Die-cast metal/Plastic. 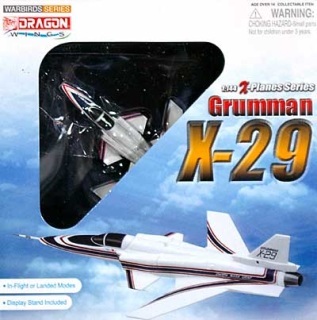 Second X-29 Prototype, 82-0049, marked and configured for its 120 flights under Phase two of the test programme concerning high angles of attack up to 67 degrees and for which it was fitted with spin recovery parachute at the base of the fin. 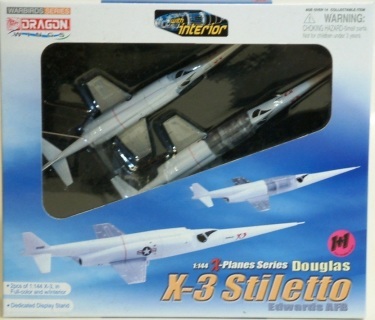 Now displayed at Edwards AFB Dryden Flight Research Center.